no show or cancellation within 48 hours of arrival in the months June till end September: full amount will be charged. Other months no show or cancellation within 24 hours 50% will be charged. Cancellation before 48 hours of arrival no costs will be charged. Durres has a lot to offer, from beach, sun, great seafood to the roman amphitheater; which was only discovered in the 1960s. The city has a Mediterranean feel,and you can enjoy this lifestyle by having a coffee or drink in one of the many bars. We offer free breakfast and wifi. There is also free parking next to the hostel. And usually our volunteers prepare a great dinner in the evening, you are welcome to join and chat with your fellow travelers. 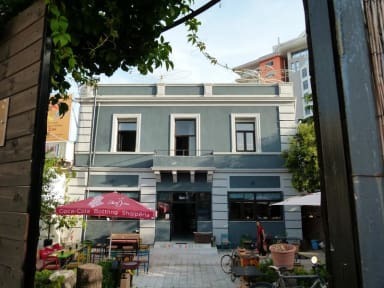 The hostel has a nice shady garden with a small bar, and also a roof terrace which has a nice view around the square where you can relax and lie in the sun. We have 8 rooms, of which 2 rooms are private and have its own bathroom. 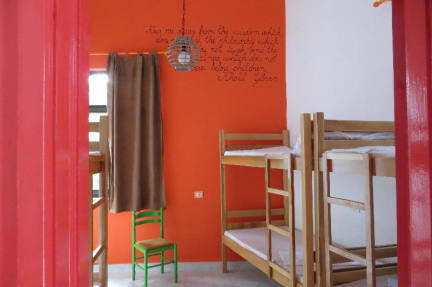 The other rooms are dorms, varying in size between 4 and 8 beds. There are 2 shared bathrooms with showers and toilets, which are completely RENEWED in January 2018! Durres is a great place to start some daytrips. As it is centrally located and the major transportation lines run passed the city. You can make daytrips to Tirana, Divjak National Park for birdwatching, Kruja Catsle and many nice beaches like Bishti i Palles or Capi Rodonit. Car rental is available in town, we can arrange this for you. Nice hostel with friendly people.